This tall Christmas bouquet is graphic, bold and stylish! 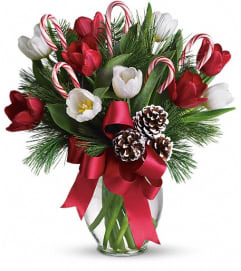 Red carnations mingle with evergreens and white blossoms, while candy canes and a fancy red and white striped ribbon add a touch of peppermint joy. 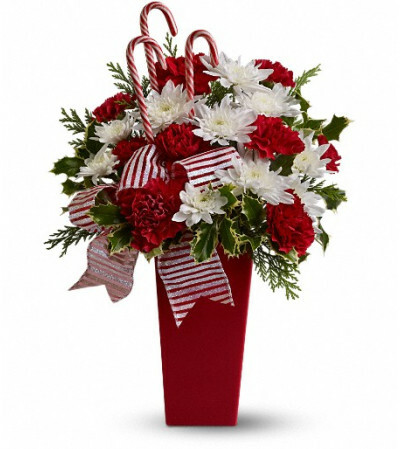 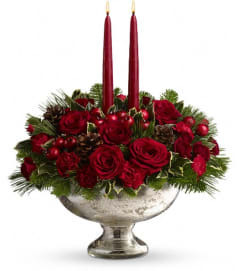 A mix of red carnations, white blossoms and evergreens - plus candy canes - is delivered in a tall red vase, decorated with a red and white striped ribbon.